Second place Arsenal will host seventh place Manchester United in the twenty sixth round of the English Premier League on Wednesday, February 12th, 2014. This is the clash of the Red Giants as they say. Arsenal got destroyed by Liverpool over the weekend with five goals to one. It was 4-0 after the initial twenty minutes. They are behind Chelsea now in the tables, and with thirteen games to go in the season, as well as a tough schedule ahead, Mesut Ozil and the Gunners have to try and turn it on. Their next three games are vs. Man Utd, Liverpool (FA Cup) and Bayern Munich (UCL). Should be very interesting. Manchester United just had another nightmare game at home vs. last place Fulham. The Red Devils dominated, struggled to come from behind and with twelve to go on the clock, they finally did. They went ahead shortly after, only to let another one in in the 93rd. The final score was 2-2. Fulham maybe had four chances the entire game. This comes a week after Man Utd lost to Stoke 2-1 away. David Moyes and his team are now nine points behind fourth place Liverpool and their chances of playing UEFA Champions League football next season are diminishing with every round. The home side are the favourites to win, and by a stretch. Olivier Giroud and Robin van Persie are the favourites to score at 6/4 each, while Javier Hernandez and Wayne Rooney are valued at 2/1. 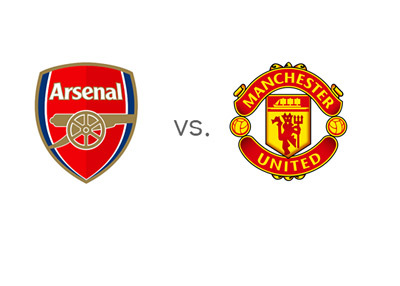 Both Arsenal and Manchester United have to react on Wednesday, which could make this a very good game! The score at Old Trafford, earlier in the season, was 1-0 for Man U. The kick-off is at 7:45 local time.